May 31st 12pm-8pm Party on Pine, Beach Cities Roller Derby, Badfish Roller Derby and Pigeon’s Moxi present a new event to the 700 block of Historic Old Pine Avenue in downtown Long Beach. The first annual “Running of the Dames” will pay homage to the world famous Encierro of Pamplona, Spain, also known as the Running of the Bulls. 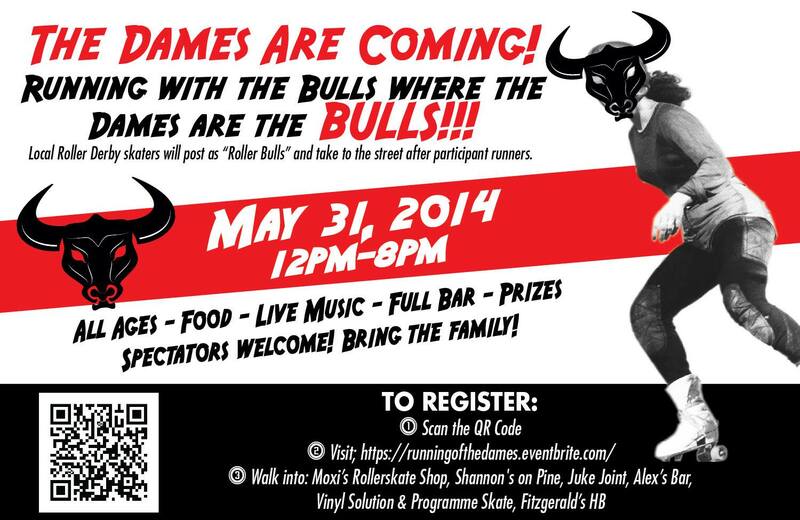 Local Roller Derby skaters will post as “Roller Bulls” and take to the street after participant runners. The festivities will be followed by an after-party in the neighboring parking lot of Anderson’s Paint & Hardware. Join us for prizes, local bands, a full bar and more! The event is all ages and free to spectators! Bring the family to the watch the spectacle! Runs will start at 1pm and will happen every hour, on the hour. The winners of each round will compete in a final run. Anyone that registers before May 25th will receive a free event t-shirt. Or register in person at Moxi’s Rollerskate Shop, Shannon’s Bar, The Juke Joint, Alex’s Bar, and Fitzgerald’s HB. Day of event registration and check-in starts at 10:00am at Anderson’s Paint & Hardware. Sponsored by: Millworks, HOPA, MADHaus, Pabst Blue Ribbon, Anderson Paint & Hardware, CALB, Moxi Roller Skate Shop, Hawleywood’s Barbershop, Layrite Deluxe Pomade and Long Beach, Kalif.